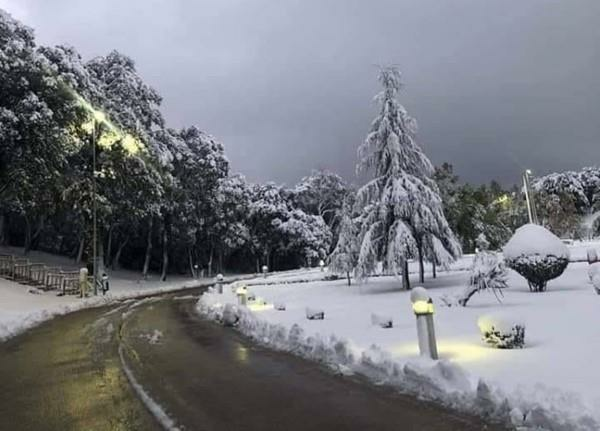 (MENAFN - Morocco World News) ">Rabat- On Sunday, October 28, the towns and cities of Azrou, Midelt, Boulemane, El Hajeb, Imouzzer, and Ifrane in the Atlas Mountains woke up to the spellbinding view of 30 centimeters of snow. More snow is expected to fall this week. Weather forecasts predict more snow on the reliefs of the High and Middle Atlas Mountains and the peaks of the Rif mountains on Thursday. Moroccans have welcomed the early snow, and some tourists are feeling lucky to have chosen a fall vacation in the North African country. Azrou-MoroccoSnow in the Atlas usually falls in December or January. Last year, the first snow came in December. In January, the country's desert regions in the south, Ouarzazate, Taroudant, and Zagora, known for their extremely dry weather, experienced snowfall for the first time in more than 40 years. Ouarzazate, January 2018Today, four days after the snow fell, it continues to coat the peaks of the High and Middle Atlas. According to the Directorate of National Meteorology ( ), the low temperatures today will range from 0 to 6 degrees Celsius on the reliefs; 5 to 10 degrees Celsius in the Oriental, Saiss, and the southeast regions; from 10 to 15 degrees Celsius in the northern, central, and the northern part of the southern provinces; and from 14 to 19 degrees Celsius in the far south. The high temperatures will be between 12 and 18 degrees Celsius in Saiss, the Oriental and the phosphates plateau; 18 and 23 degrees Celsius in the northern, central and southeastern regions; and between 24 and 30 degrees Celsius in the southern regions. Dim streetlights pouring into the scenic whiteness of snow, matching the horizons of Ifrane.